Red Falcon, probably the most interesting of the magnetic figures (not counting Geag of course). Red Falcon just doesn't seem to have much of a place in the Micronauts lineup. His head has that elfen Japanese anime look to it. 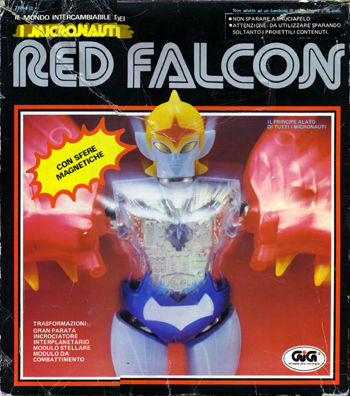 Red Falcon was only released in Italy by Gig, hence this is the Italian box. It sports a small black sticker in the righthand corner that is most likely a warning about shooting people's eyes out with the missiles (boy, so much for having any real fun with the toy...).